Infinity in a song. There is a constant tension between contingency and eternity in Jon Foreman’s music. 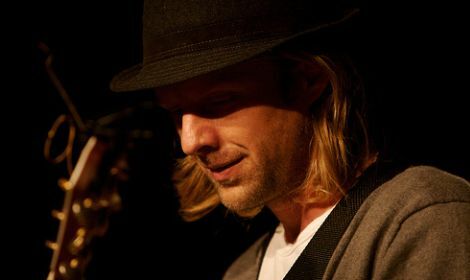 In more than ten years of career as a leader of Switchfoot, Foreman has earned platinum records and Grammy nominations. As a soloist, last year he showed himself through the intimate songwriting of a series of Eps inspired by the cycle of seasons. A path focused on the willing to compare everything with his own questions. In this exclusive interview, every word has a distinct weight: that of experience faced up to its roots. In Italy both your name and the name of your band are not so popular as they are in the U.S.... If you had to use a single sentence to introduce yourself to someone who doesn’t know anything about your music, what would you say? Guitar driven music for thinking people. Could you tell us something about the beginnings of your music path? When and how did you realise you wanted to be a musician? After ten years with a successful band, what prompted you to challenge yourself with a soloist experience? What does it take to always look for something more and to keep one’s own questions alive? I’m frightened by the unknown but I’m also drawn in, I want to know what’s on the other side. In some ways, these EP’s came from this drive. But mostly the songs determined their own fate, I was just following the loose threads. I suppose most of the best questions in my life come from pain. When we experience elements in life that are beyond our experience are often we encounter what’s most important, maybe even The Other. Fear can kill these questions if you’re not careful. There are plenty of biblical references, often inspired to verses taken from the Psalms, in the lyrics of your Eps. The Dylan-esque songwriting model (the one evident in songs like “Every Grain Of Sand”) seems to have deeply impressed you. Nowadays what makes those words still capable to reach the heart? I’m not exactly sure what gives words their power. An old song can lose it’s power no matter how true it is. I feel like the role of a songwriter / prophet / lover / friend / human is to seek and tell the truth in ways that are appropriate to his/her unique situation. In the Judeo-Christian story of creation you have a God who speaks words into being. Whether you’re writing a song or offering encouragement to your girlfriend - you are entering into the creative, relational god-like realm where words have incredible power. All of us among the living have this in common: death is coming. It’s in this tragi-comic state where we seek meaning and hope. These are where my songs come from. This is the common ground. The hoping, the searching, the dreaming, the living, the dying. These are my peers: atheists, christians, agnostics, surfers, students, homeless and millionaires. It’s unfortunate and all too predictable to believe that the only folks for me to love are the ones that I agree with. This type of thinking fuels racism, fascism, and fear. And you can see this horrible strain of intolerance in both the right and the left. Yet music is one of the only guests who makes it into our minds uninvited. I treasure many songs written by people with different understanding of life. I expect that open minded folks would hear my songs in the same context: simple expressions of truth, beauty, pain, and hope. The concept behind your Eps, which is dedicated to the changing of the seasons, seems to revolve around the sense of time. In the last song of the entire cycle, “Again”, you use the image of men’s hearts conversion as the key to the story: “You are turning our hearts back to you”. Faced with the drama of the times we live in and with the scepticism of those who believe that nothing can change, do you think that such an ideal may be realistic or utopian? I believe it was CS Lewis who said that he supports democracy because he distrusts all men equally. I can understand his sentiment, I have very little faith in men. I believe that the Infinite Other himself is the only hope for any form of freedom from our various forms of self-tyranny. Without this hope I am not merely skeptical, I am hopeless, near suicidal. In the very heart of your lyrics a reversal of perspectives can often be found: for instance, revenge matches with love in “Revenge”, love matches with sacrifice in “Baptize My Mind”... What do these apparent paradoxes mean in your personal life? Much of life is in tension. The dark with the light, the bitter with the sweet. Like a guitar string strung tight between two poles. The tension is awkward, unsettling. And yet without the tension the string has no tone. Often the human soul can be like that. I'm drawn to poetry because the tension of these paradoxes is accepted and not explained away. I hope that my life is one that enters into the tension and refrains from running away. The symbolism of your four Eps is also evident on the front-covers, where there is a tree whose appearance changes with the passing seasons together with the colour and the texture of the paper landscape which serves as a background. The attention to the artwork, the use of recycled paper, the taste for the physicality of cds: did you personally look after all of these aspects? I did all of the artwork myself. You recently published “Limbs & Branches”, a compilation of songs taken from your four Eps which also includes a couple of unreleased tracks. As far as we could learn from the web, you’ve selected the songs starting from a chart of your fan-base’s favourite songs. What are Jon Foreman’s four favourites (one for each Ep)? Could you tell us something about the two unreleased songs? Hmmm... I’m really not sure how to pick four. The two unreleased songs are songs that were recorded during the process but for several reasons never made their way onto an EP. One is a really dark song. The other is a bit more hopeful. The symbolism of the tree appears again on the front-cover of “Limbs & Branches”: the colours and the scenery used for this compilation suggest that you’ve chosen a mid-seasonal setting, going back to a scenery similar to that of your first Ep. This recalls the movie by Kim Ki-Duk “Spring, Summer, Autumn, Winter ... And Even Spring”, in which through seasons the Korean director describes a vision of existence seen as a slow and inevitable cycle of events. Do you think that life is an eternal circle or a road with a final destination? Much of life is spinning. Meaningless, meaningless, all is meaningless. And yet there are sparks and flashes of transcendence... moments where the temporal allows a bit of the infinite into the room. I believe this indicates a greater significance than the spinning. I believe we are held responsible for how we treat each other, that neither love nor hate are inevitable or eventualities - both war and kindness are choices. Quoting the famous prophecy by Dostoevsky: “Beauty will save the world”. What does a song need in order to bring a bit of that absolute beauty? Honesty would be a good place to start. You grew up as an artist in a band that was founded by a group of friends. Someone said that in life you can make all the mistakes you want, but not when choosing friends. How much importance do your friends have in your personal path? I’m alive because of my friends. On your MySpace page you state that you have been into ongoing live performances since 1997. What were your feelings in 1997 when you went up on stage and the silence fell upon the audience, just before the beginning of a concert? And what are your feelings today? In 1997 the audiences we were playing for rarely got silent! I hated playing live music because of the finality: every note (mistake or otherwise) is final. I much preferred the recorded form of music where I could find a bit more grace. My feelings today are often the other way round. I love the finality of a live show. Anything can happen. When the right things to go wrong you’ll find yourself pushing harder than ever before. These are the moments when the music pulls you forward rather than the other way round. Last year together with the Switchfoot you wrote a song that was included in the soundtrack of the second “Chronicles of Narnia” movie. C.S. Lewis claimed to have written the Narnia saga because he did not want education to be based on duty or moralism, but rather on empathy. “An obligation to feel can freeze feelings”, he said. What do you think about it? I’m not entirely sure about the context of the quote... but I do feel that empathy is a better motivator than math. The most educated men in the world are often employed to win wars. Duty can be found behind some of our lowest moments as a species. “Lowercase People Records”, the label that released your solo works, is part of a larger project founded by Switchfoot to give relevance to the “lowercase people”, promoting unknown artists and supporting the Third World communities. Could you tell us something about this project? Your soloist Eps are like a personal diary. What is the core of Fiction Family, your new project with Sean Watkins from Nickel Creek? The core of the tunes with Sean are fictional, like the name implies. For example, “The Sun Also Rises” was the inspiration for “Please Don’t Call It Love”. The word “switchfoot”, which gives the name to your band, comes from the surfing jargon and it indicates the ability to surf in switch stance, almost like being ambidextrous. Surfing is one of your greatest passions and whenever you have the opportunity you fly over the ocean to practice it. Which of the teachings you learnt from this sport could be applied to your music?